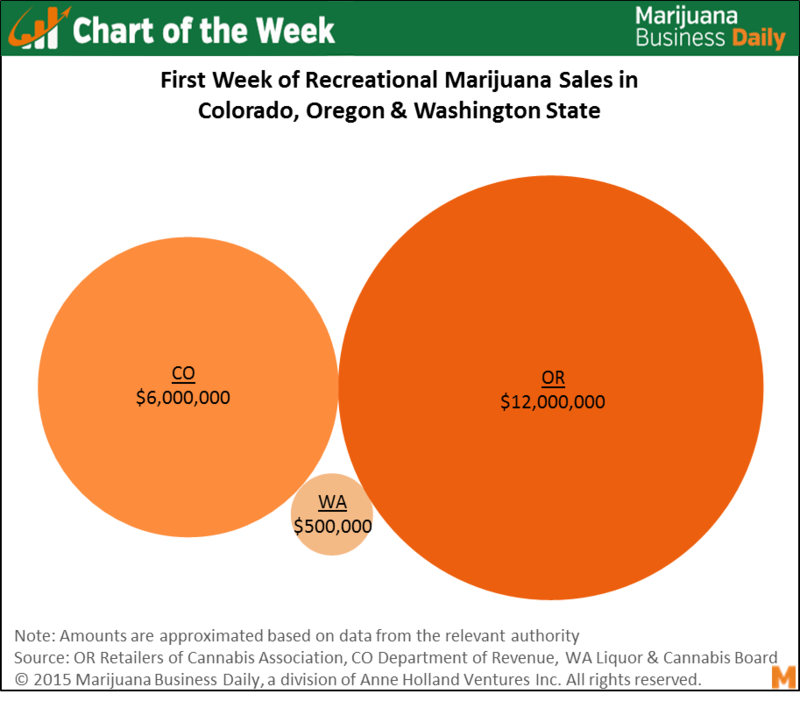 The Marijuana Business Daily has released a surprising side-by-side analysis of the first week of recreational cannabis sales in Colorado, Washington State, and Oregon. As columnist Becky Olson points out, Colorado already had an established network of regulated, medical dispensaries when it started rec sales on Jan. 1, 2014 Prices averaged $15/gram, plus nearly 30% in state taxes, yielding upwards of $6-million in sales. Things weren't quite as smooth in Washington State on July 8, 2014: dispensaries weren't governed by state regulations, so most didn't apply for rec licenses. Stores faced severe inventory shortages, and prices/sales tax rates were some of the highest in the country at $20/gram. Overall, sales hit just half a million dollars. By contrast, Oregon's Oct. 1, 2015 start was much more rapid, with nearly 250 businesses selling to rec customers right out of the gate. An abundant supply – and no sales tax - led to bargain-basement prices of about $10 per gram, and an estimated $12-million in sales during the first week.